Pongal is celebrated the day on which the sun begins to move northwards is called ‘Makar Shankranti’. In Tamil Nadu this festival is called the Pongal or Thai Pongal. The period is referred to as Uttarayanam and is considered auspicious. Pongal is a four-day festival. The first day, Bhogi, is celebrated on the last day of the month of Margazhi. On this day, people decorate their homes. New vessels are bought and clean up home and environment. The second day is Perum Pongal, is the most important. People worship Surya, the Sun God. Women decorate the central courtyard of their homes with beautiful kolams, done with rice flour and bordered with red clay. The Pongal payasam is cooked in the early morning during the sunrise, exactly at the moment when the new month is born. The third day is Mattu Pongal, celebrated to glorify cattle that help farmers in a myriad ways. On this day, the cows are bathed and decorated with vermilion and garlands and fed. The last day is Kaanum Pongal. It is that part of the festival when families used to gather on the riverbanks and have a sumptuous meal. It is also time for some traditional dances such as kummi and kolattam. Special prayers are offered by women for the well-being of their brothers. Pongal ushers in the New Year in Tamil Nadu. Newly-harvested grains are cooked for the first time on that day. Joyous festivities mark the celebration in every home. The poor are fed and clothed. 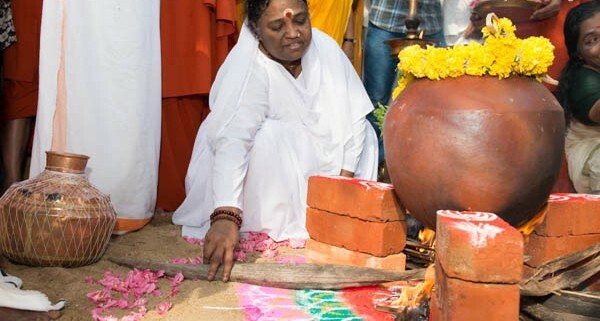 On the next day, the cow is worshipped, and birds and animals are fed. The Sun is worshipped as the embodiment and source of Life-Force, without which we could not be. Payasam is offered to the sun seeking his blessings, and then eaten as prasad; the second day, animals are venerated, usually through the worship of a representative cow, which again is offered sweet payasam; the third day sees the family relations worshipped, of course through more offering of payasam, and, more importantly, through the coming together of family members. If there have been arguments or miscommunications in the family, this is the day when the air is cleared and hearts are opened. It can be a very healing time, restoring a deep relationship with the Universe, Mother Nature and one another. Through this festival, the Creation is recognized as the miraculous divine blessing it truly is. 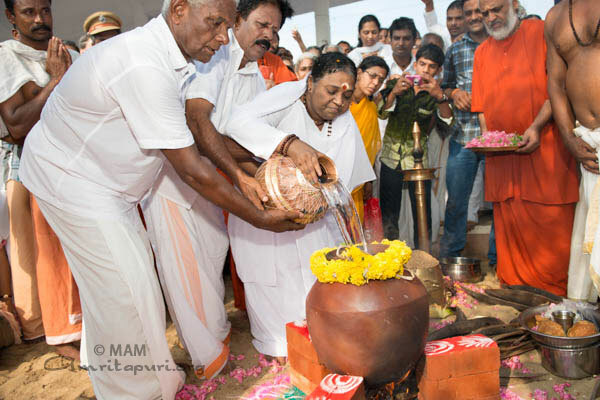 Amma also explained an interesting point about the intelligence behind this kind of worship, saying that it is not superstitious, but in fact very practical. During this particular festival for example, the tradition of cooking payasam and allowing it to boil over is observed all over South India. This overflowing of sweetness represents the Prema (Divine Love) that should overflow from our hearts towards all of Creation. Amma continued with a remarkable point. She said that the steam rising from the rice, jaggery, cardamom and other spices being boiled in so many households and mixed with the smoke from the firewood traditionally used, actually creates a special medicinal combination that has a very beneficial effect on the atmosphere. The collective observance of this and similar practices has a positive effect on both the ‘mental environment’, as well as the weather, climate and harmony of Nature in general. This is just one aspect of the subtle wisdom underlying these simple, elegant customs. 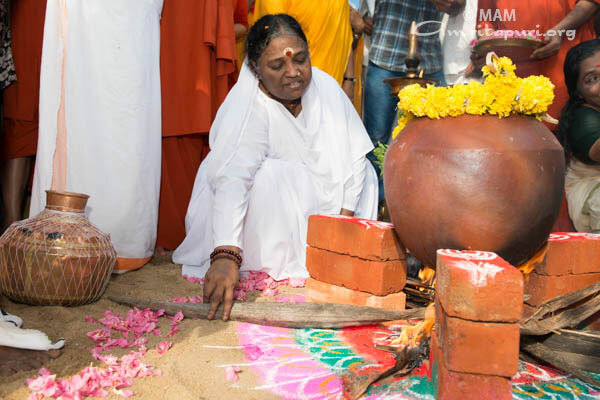 “Pongal means ‘to overflow.’ The time when humankind’s love for nature and nature’s love for humankind overflow—that is Pongal. Human beings make nature happy by having good thoughts and doing good actions. Nature blesses humankind with a bountiful harvest. 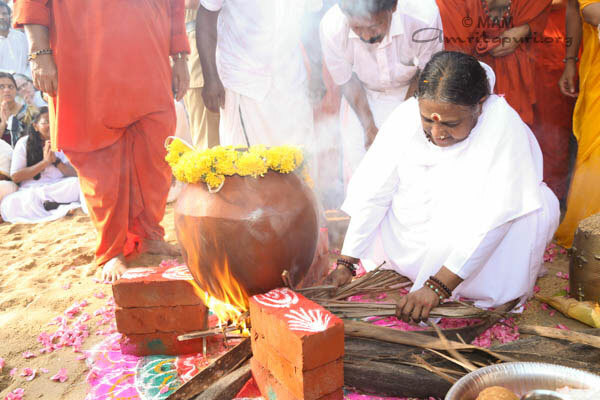 When the universal mind and the individual mind overflow and become one—that is what Pongal is symbol of. “Matru-devo bhava, Pitr-devo bhava, acharya-devo bhava atithi-devo bhava—‘May you see your mother as God, your father as God, your teacher as God, your guests as God’—this is what Sanatana Dharma teaches us. Respect everything, worship everything. Why? Because there is nothing other than God. May this Pongal Festival be an opportunity for you to you to instill this culture and God deeply within and spread it without. “Festivals are, in fact for everyone living in the area. Even people working far away will return home in order to participate. Everyone will sit together, eat together and remember old times together. On such occasions, we experience the joy and exuberance that occur when hearts come together. These festivals are sacred moments that help us to establish love and unity and nourish our relationships.